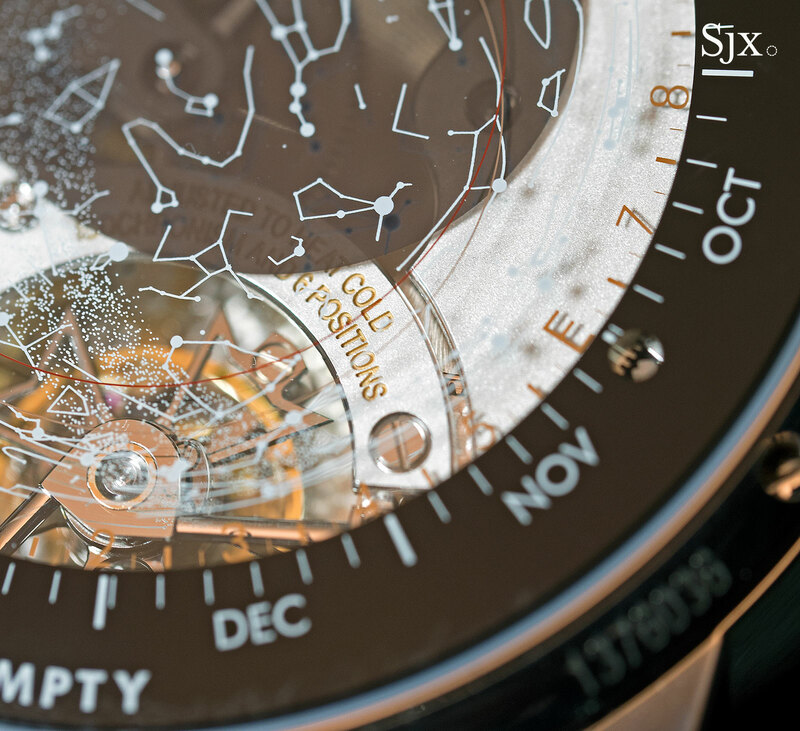 The universe in miniature inside the most complicated Vacheron Constantin wristwatch. 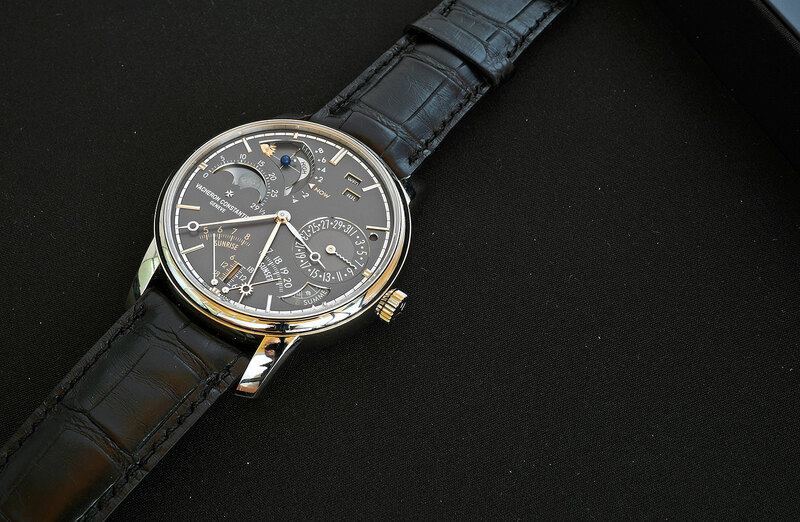 Vacheron Constantin’s headline watch at SIHH this year was a grand complication that concentrated on astronomical functions: the Celestia Astronomical Grand Complication 3600, “Celestia” for short; “3600” refers to the calibre number. The Celestia was developed in Vacheron Constantin’s Les Cabinotiers’ workshop that was set up in 2006 with a mandate to design and manufacture client commissions, essentially one-off, custom timepieces. But it is also tasked with the manufacture a small number of complicated watches and movements for the company, like the Celestia and the Symphonia Grande Sonnerie introduced at the same time. 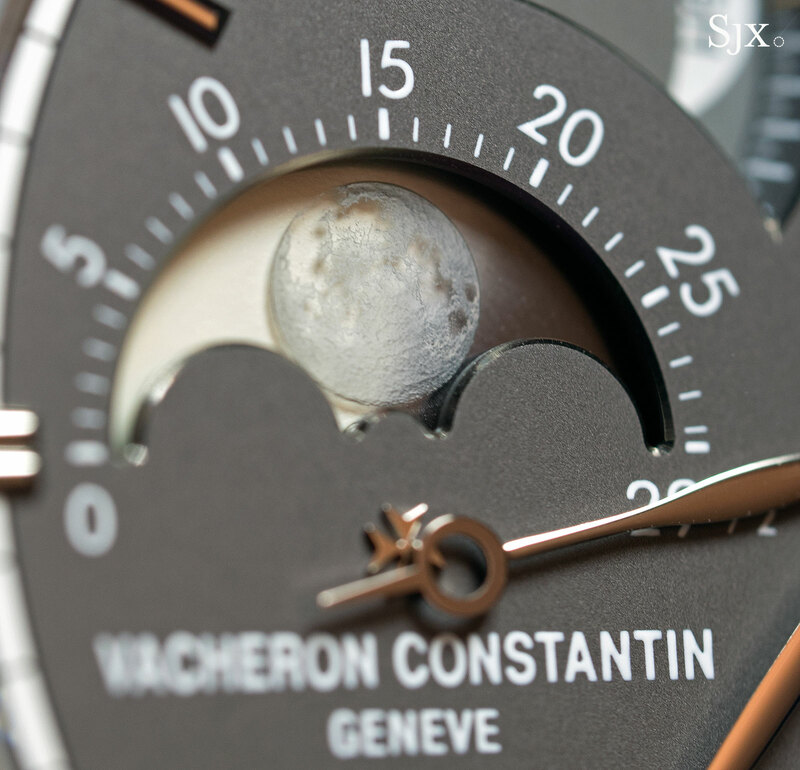 When Vacheron Constantin started work on the watch, there was no buyer for it, although shortly after the announcing the watch, the client duly appreared. What was learned from the process of manufacturing the Reference 57260, the world’s most complicated watch that made its debut two years ago, was put to good use in developing the Celestia and its cal. 3600. Part of the attraction for the Celestia, and therefore part of the inspiration for its conception, is the history and nature of why such watches and clocks were needed in the first place. Essentially the Celestia is the latest in a long history of clocks and watches that use the Earth’s position in the heavens to explain and predict other temporal phenomena that affects us all, seasons, tides, and the length of the day. The Celestia is arguably a return to the original reason precision watches, or more precisely chronometers, were created in the first place – to solve the “Longitude Problem”. Go back far enough to the age when the time of day was read from the church clock tower, and astronomic clocks existed to signify order and mechanical certainty in the heavens, and naturally most were in church clock towers. Astronomical clocks in Rouen, Strasbourg, and Prague are good examples. As day follows night, and the moon waxes and wanes, the certainty of life, death, mortal sin, and time in purgatory all had a certain cycle to them. But the original imputeus for accurate watches, or an exact timekeeping method using the night sky, was navigation away from the sight of land – the Longitude problem – the need to determine you were on while on the high seas. Originating in the 16th century, the idea to draw imaginary lines on maps, both horizontal (latitude) and vertical (longitude), provided the link between time and distance. Since there are 360 degrees in a circle and the Earth is a sphere for all intents and purposes, then there are 15 degrees in each hour in a mean solar day of 24 hours. So time equals longitude. Longitude was important for the ever increasing volume of seaborne trade, especially in the 16th to the 18th centuries, because errors in navigation resulted in shipwrecks and insufficient rations when voyages went astray. Although Britain was not alone in offering financial inducements to encourage a workable solution to the Longitude problem, it was the establishment of the Board of Longitude in 1714, with a prize worth millions of pounds sterling in today’s money, that caught the attention of the day’s clockmakers, and historians ever since. 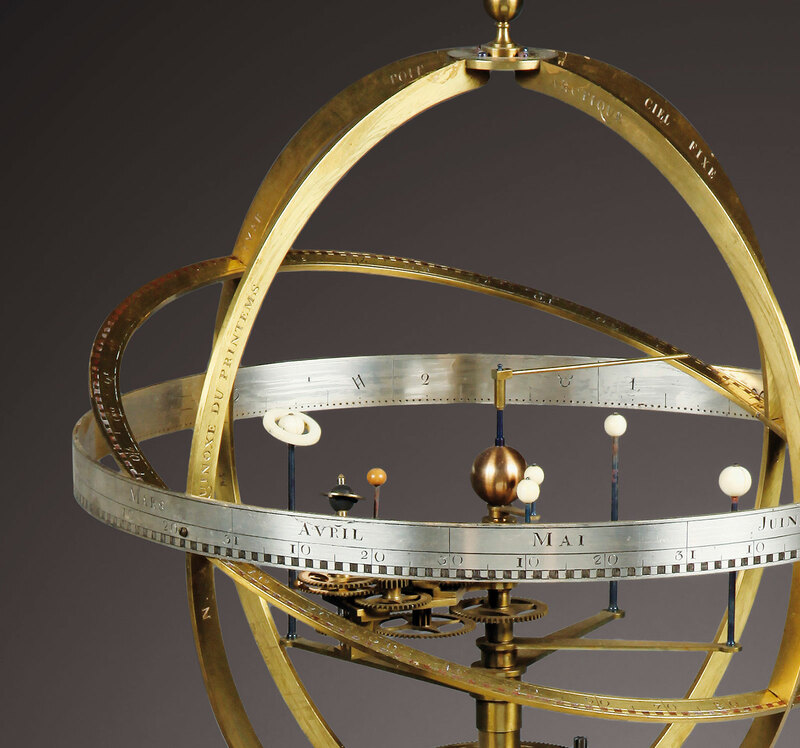 There were generally two solutions that met the requirements of the Board: John Harrison’s H4 marine chronometer, which would provide an accurate measure of time at sea, and the lunar distances method that relies on sightings of stars. All that was required for Harrison’s method to work was an accurate reading of time, calling for a marine chronometer and accurate sea charts. Nothing more. While today we tend to acknowledge that Harrison’s solution as ideal, it should be noted that marine chronometers were expensive and not generally available until the mid-19th century. So the lunar distances method, using tables in the Nautical Almanac produced by the Astronomer Royal, Nevil Maskelyne, at the Royal Observatory in Greenwich, was the choice of mariners at sea for many years, though not for its convenience – the method reportedly took six hours for one set of calculations. The lunar distances method, as the name suggests, requires exact knowledge of the distances between celestial bodies to determine the correction for time. Since it required exact measurements from a particular point on earth, the lunar distances method was the principal reason for the founding of the Royal Observatory at Greenwich in the late 17th century, and also provided the impetus for establishing the Greenwich Meridan in the late 18th century. Not only is there a relationship between longitude and time, but also between time, the seasons, the phases of the moon, the height of the tides, and our position in the heavens. And its that connection between it all that has provided fascination and some highly elaborate watches as well. The measurement of time and the heavens was helping to determine man’s place in the universe, and what to expect at a certain time of year, as science replaced religion as the explanative power in people’s lives. 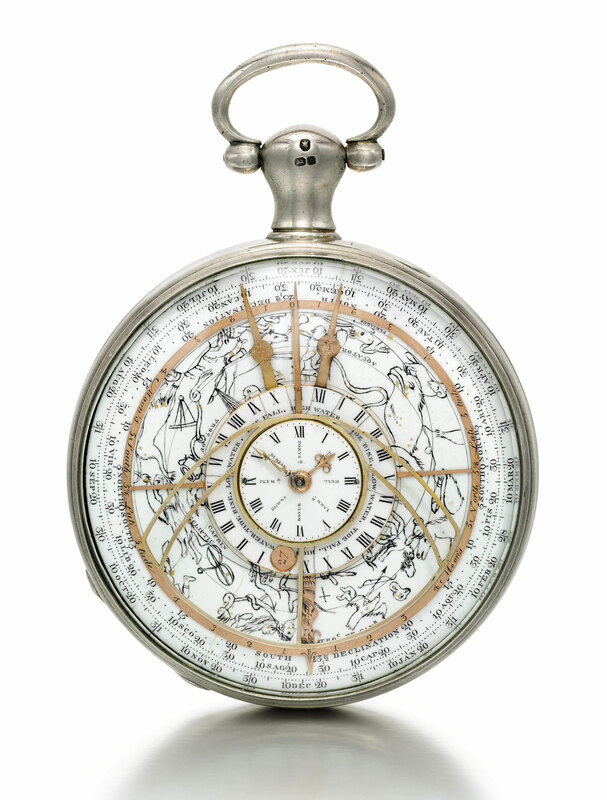 However, any watch that contained an array of astronomical complications was often more for the interest and enlightenment of the owner – usually someone with the necessary finances – rather than as a scientific instrument for the mariner at sea. More importantly a watch that held astronomic functions as well as accurate time would therefore be able to utilize both methods for navigation. Various watchmakers tried different forms of clocks and various designs to build a clock that would link time with the motion and position of the heavens above. Early examples of such watches and clocks were made by Antide Janvier, Benjamin Hill, George Margetts. However, attempting to reduce the timing of heavens to mechanics rarely ended with the watchmaker being declared a genius. Janvier ended his days in relative poverty after having been cited as a Royalist, having been a clockmaker to Louis XVI, in revolutionary France; Hill lost most of his watches and clocks in the Great Fire of London; while Margett ended his time on Earth committed to St Luke’s Hospital for Lunatics. 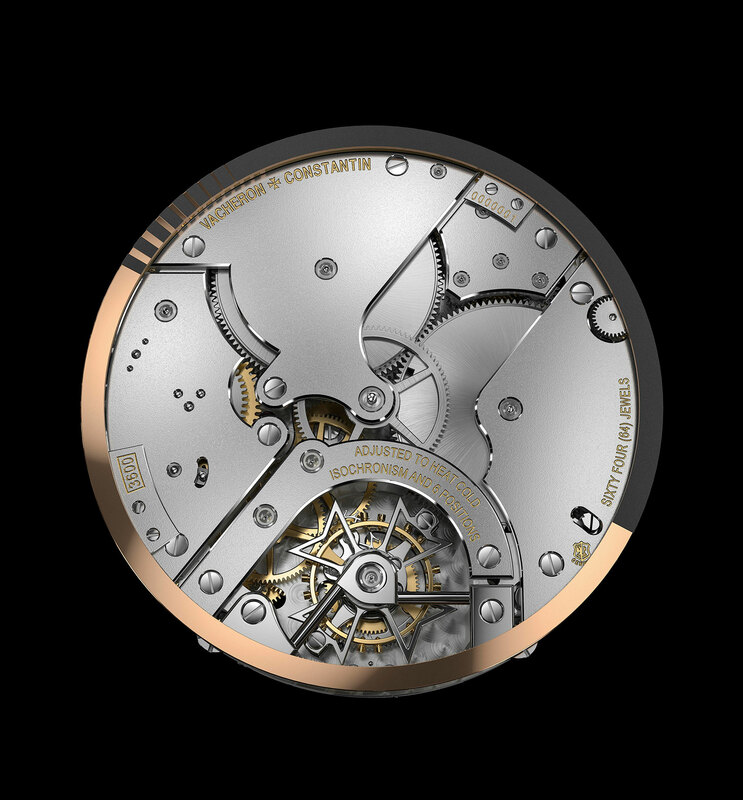 Time itself is a product of our place in the universe and the Vacheron Constantin Celestia is a representation of that. In effect, the watch is an analogue celestial computer that will calculate the time of day on Earth, in any form, and everything else you might need besides, including the state of the tides. It will both allow for navigation should your GPS ever give out, and in some senses provide a finer consideration of the workings of the heavens above. And in that, the watch is a unique – and heavenly – combination of complications in a size that will fit your wrist. 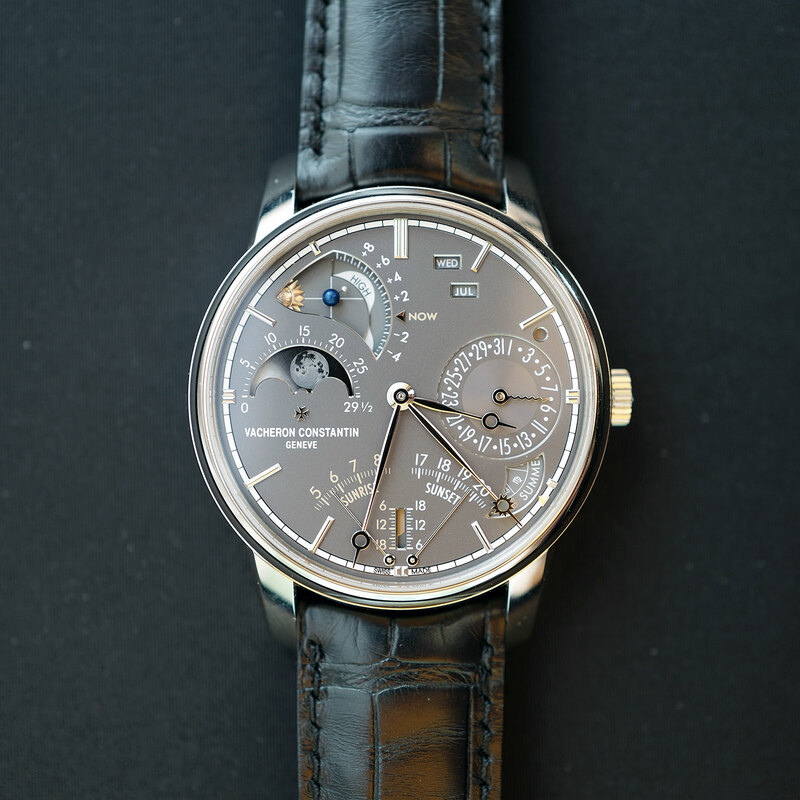 The representations of some of the complications are new and Vacheron Constantin are to be congratulated on such an erudite and yet beautifully designed watch. It was, for me, this year’s standout complicated watch. In studying the Celestia I was able to sit down with the dapper and reassuringly sane Christian Selmoni, the Artistic Director at Vacheron Constantin, to discuss the watch, the imputeus for it, and its overall design. When I asked about the influence and inspiration behind the Celestia, Christian agreed that for the most part, the watch is not only the creation of a new calibre and an examination of astronomic complications, but the inspiration was taken from watches and clocks produced two hundred years ago. 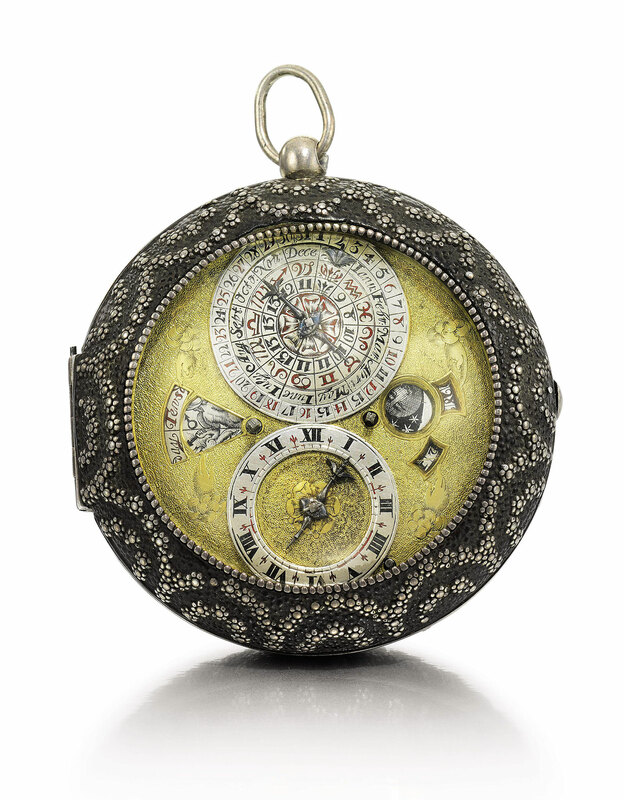 What would such a 19th century astronomical watch look like and function now? What makes the Celestia such an important watch is not just the impressive array of complications, but equally the size of the watch on the wrist – it is smaller than expected. The cal. 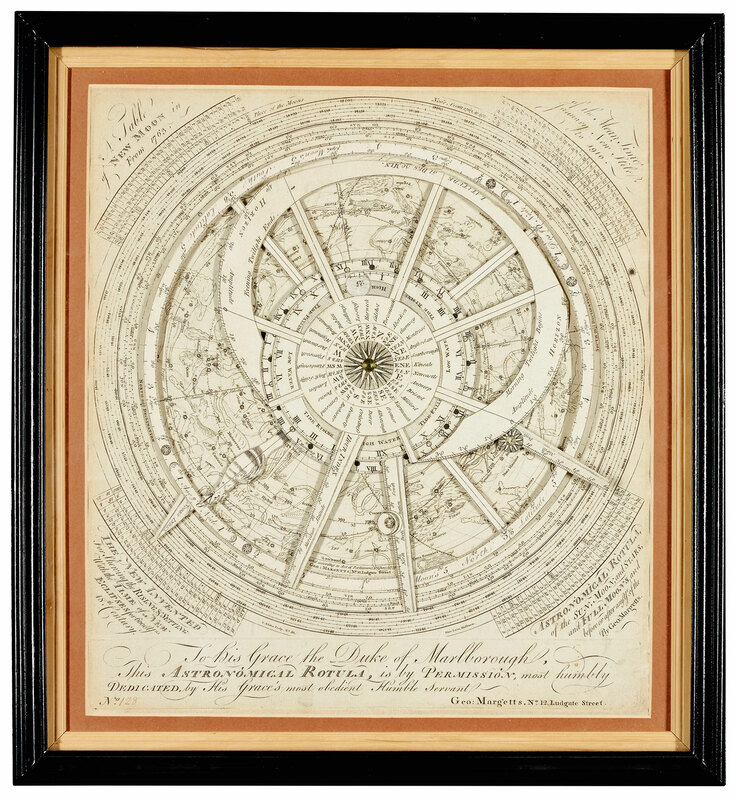 3600 is an accurate and remarkably parsimonious, both in terms of the number of parts and the layout of the dials, representation of the astronomical observations from a particular point on Earth, one that is near the equator in this instance. For that, the movement had to be pared down and focused on the three basic equations that determine the measurement of time: mean solar time (what we call the day, hours, minutes); solar time (the length of the day according to the earth’s idiosyncratic elliptical orbit around the sun which varies thanks to the angled rotation on its axis); and sidereal time (the time as measured against fixed points in the night sky). Each of these time-telling equations have their own gear train in the movement. Equally concise is the straightforward dial layout that accommodates all the complications, reading like a scientific instrument, lacking the embellishment that so often accompanies a grand complication watch. To my eyes this only adds to the harmonious layout of the dial. 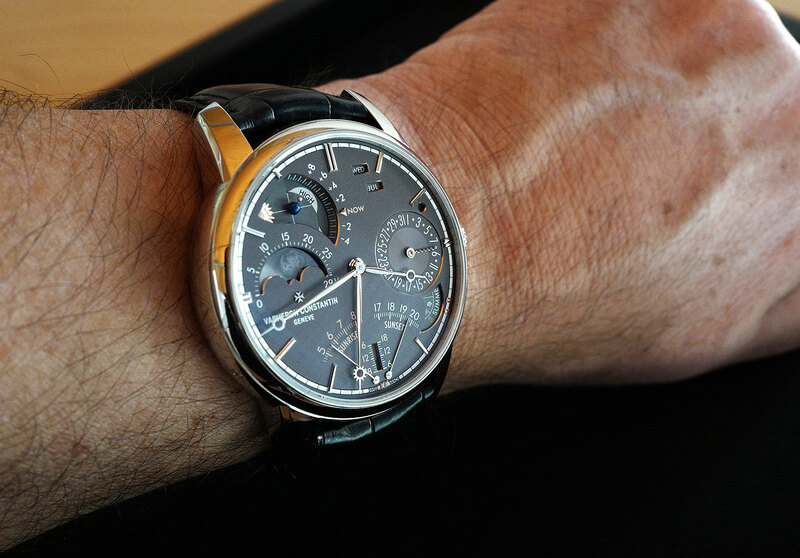 Even before reviewing the impressive set of 23 complications that are mainly astronomic in nature, there are some other notable features for the watch. 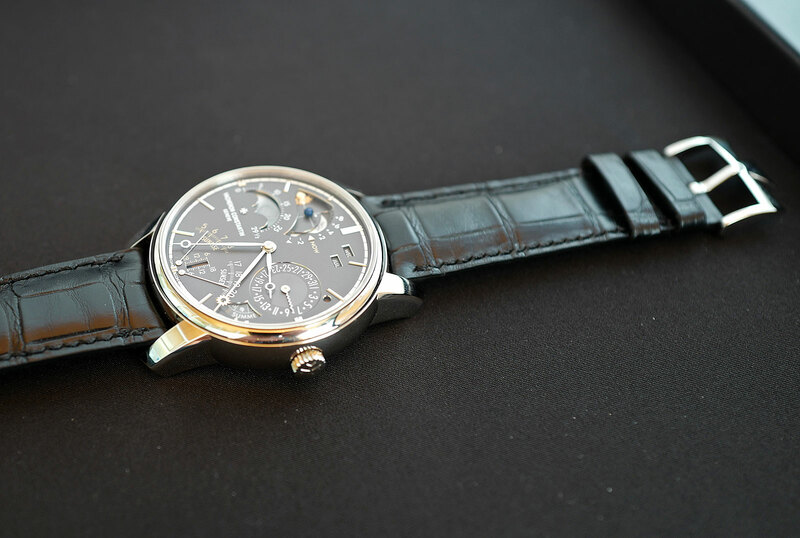 First, the white gold case measures only 45.3mm in diameter by 11.4mm deep. And for a watch with this number of complications, that is a notable achievement. The watch can be, and should be for that matter, worn on the wrist comfortably. Equally, a power reserve of three weeks (across six barrels for the main spring) for a manual wind watch is impressive on its own, but in a movement with all the other complications, that is equally a notable achievement. The watch has a novel power reserve indicator that runs along the periphery of the night sky on the reverse side of the watch. The escapement is a one minute tourbillon tucked at the base of the night sky and cased in arguably one of the more beautiful tourbillon cages on the market: the Vacheron Constantin Maltese Cross. The asymmetric design of the tourbillon bridge, to allow the escapment to fit within the case dimensions, and adds to the bespoke nature of the watch and its calibre. 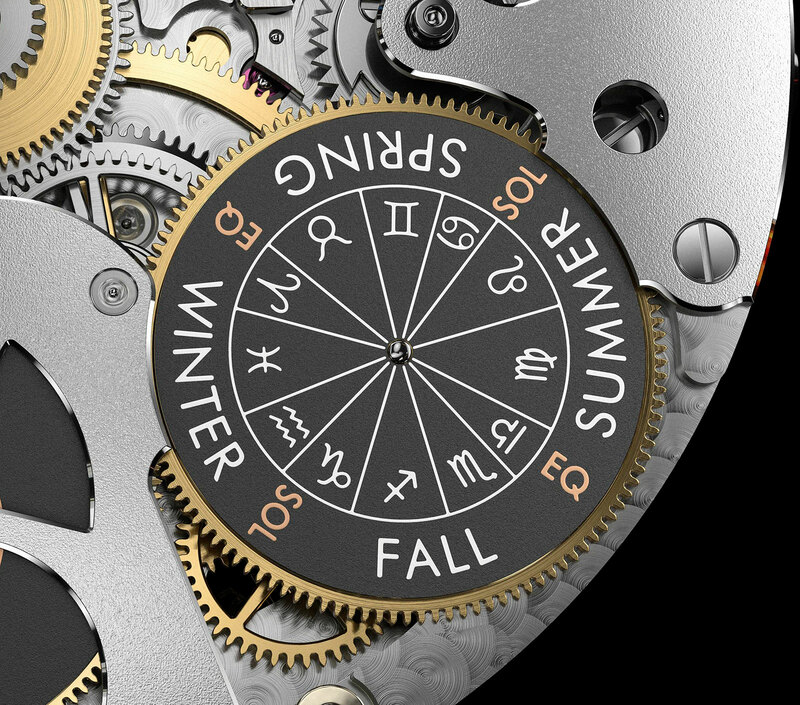 But what sets this watch apart from other grand complications is the work on the three gear trains that run the complications. As Christian Selmoni explained, a great deal of very impressive research has been undertaken to figure out how all the complications would both fit together within one watch, run off three separate gear trains thus allowing the watch a greater degree of flexibility in the number and type of complications to be included, and able to work in perpetuity. Although not one to usually undertake a list, it is perhaps the most logical way to describe how the complications work and run with each other. So let’s start with the time of day. The front dial – a beautiful shade of slate grey – has a pair of white gold, Breguet-style hands showing hours and minutes of the mean solar day, the time it takes the Earth to orbit around the Sun once and return to the same place on average. On the same axis is a running equation of time indicated by a yellow gold hand with a sun disk at the end; more on that later. In keeping with the human division of time: months, weeks, and days, the watch has a full perpetual calendar that also records leap years. The first aperture at the right hand top of the dial gives the day of the week, the second aperture the month, the right sub-dial provides the date, while the small circular aperture above “3” on the date sub-dial shows the leap year. 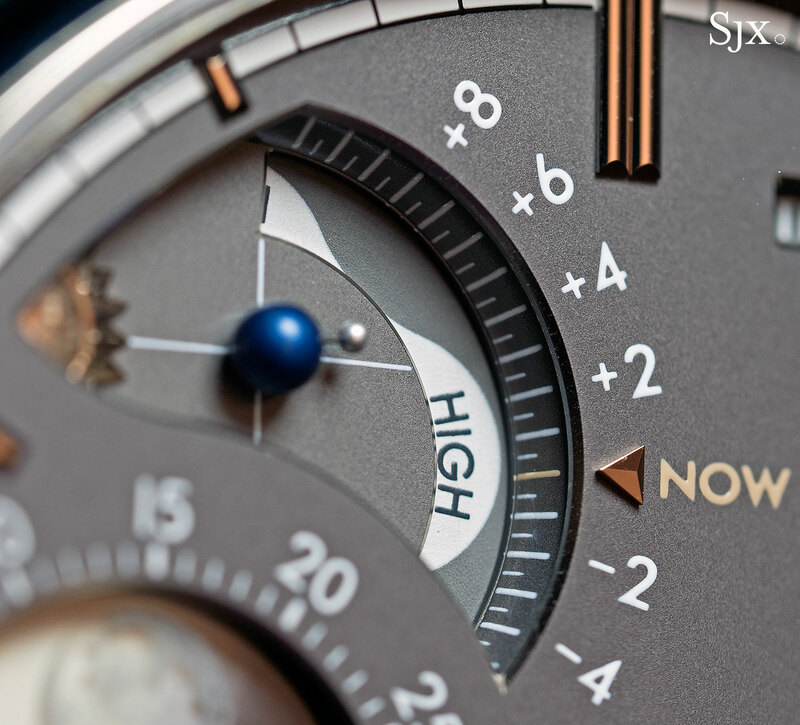 The subdial on the left is a day-night indicator combined with a moon phase display. It features two sapphire crystal disks, one for the moon and another for the day-night, which rotate over each other to stunning effect. 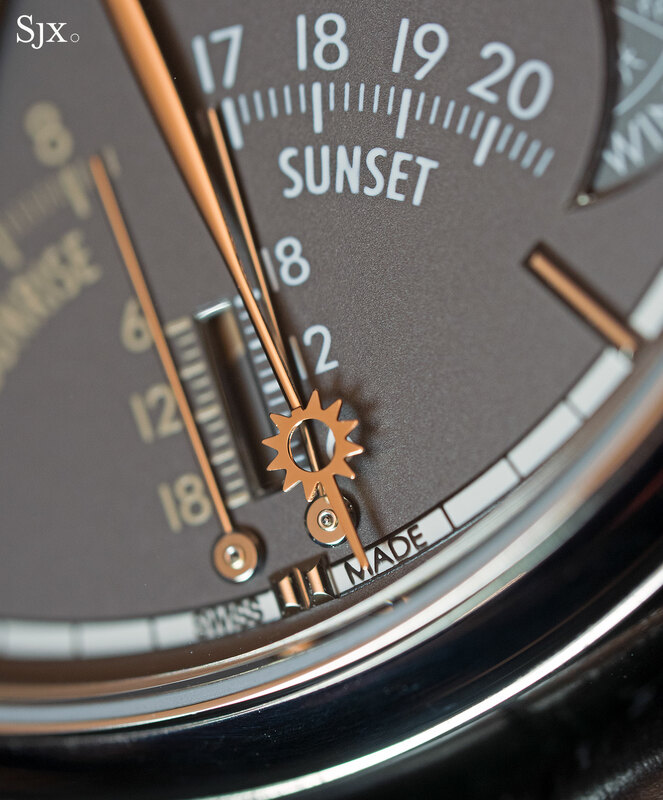 Note the day-night dial is an average, not connected to the times of the sunrise and sunset, and rotates on a 24-hour cycle. 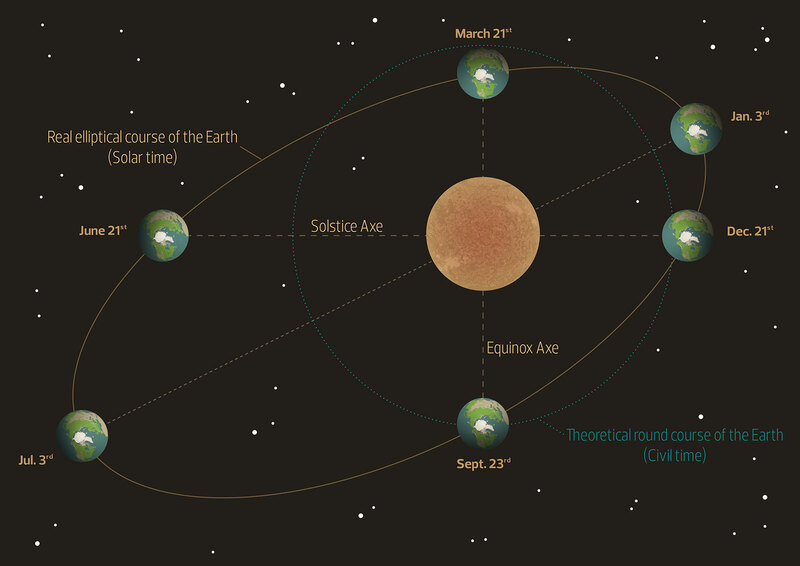 However, because of the Earth’s elliptical orbit around the sun, the actual length of a day, known as apparent solar time, varies around the 24-hour mark, by as much as an extra 14 minutes and 21 seconds on February 11 or minus 16 minutes 45 seconds on November 3, for the particular Tropical gear train on the Celestia. 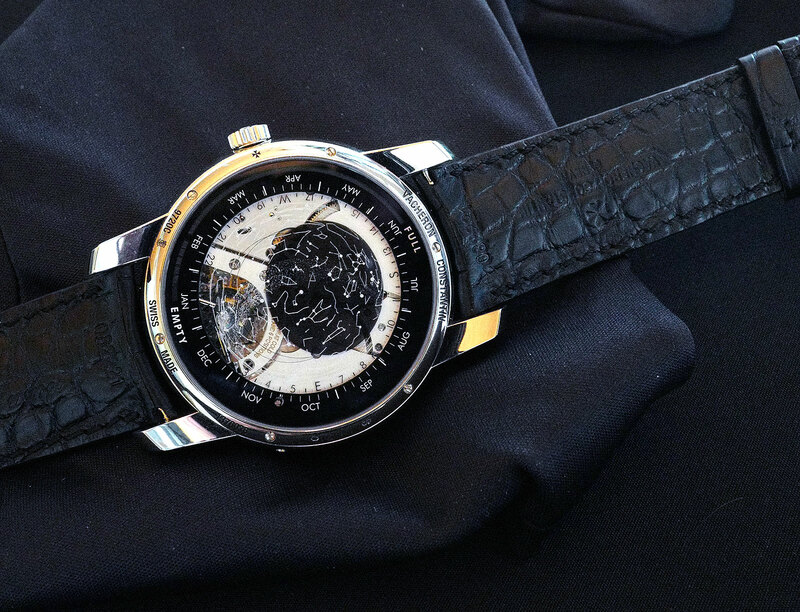 Known as the equation of time, the difference is usually displayed as a disk or separate dial that shows the difference in minutes compared to mean solar time, but the Celestia has instead a single hand for an equation du temps marchant, or running equation of time, a complication that is only found in a handful of other watches, including a recent Breguet. The equation of time hand is either ahead or behind the minute hand over the course of the year and shows in real time the number of minutes apparent solar time deviates away from mean solar time. 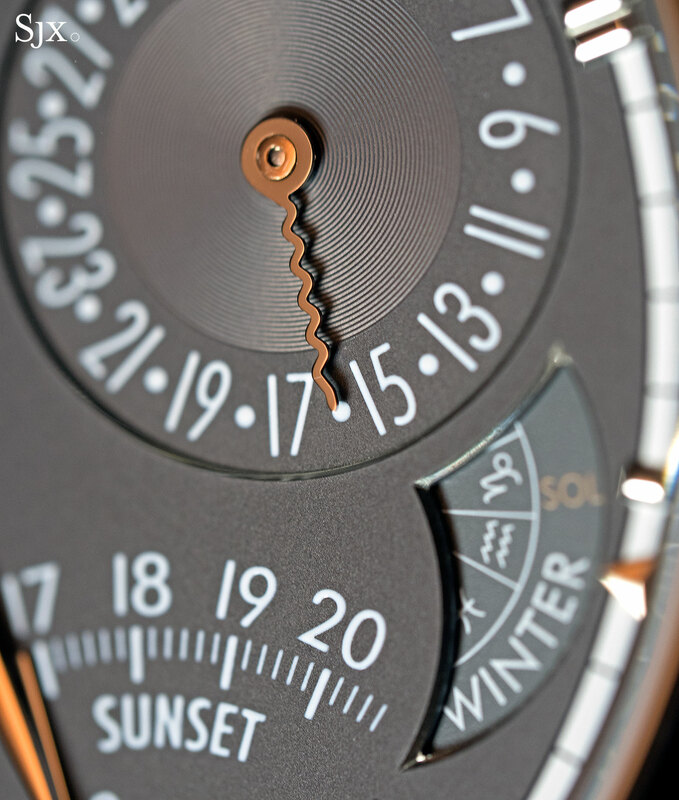 The fan-shaped pair of displays at the base of the dial provide the times of sunrise and sunset, while the vertical aperture shows the length of the day in terms of daylight hours that varies with the seasons. Times for sunrise and sunset are rare on watches as they are latitude specific, dependent on the point on Earth where the viewer is located. The Celestia is set for the tropics but if the owner wanted the watch set for his or her specific location, then this would potentially change the gearing for the sunrise and sunset, and with it the disk that indicates the length of day. At the same time, a number of other elements in the watch would have to be changed to accommodate another latitude, from the celestial chart on the reverse to the day-night disk. Located at four o’clock between the sunset time indicator and the date sub-dial is a small semi-circular aperature showing the equinoxes (the twice year occurrence where day and night are the same length all over the planet), the solstices (the longest and the shortest days in winter and summer), the seasons, and the signs of the zodiac. As the night sky is represented on the back of the watch, this small aperture is crucial to understanding what is going on above in the heavens, and the back of the watch for that matter. Earth’s orbit around the equator is an asymmetrical eclipse. At two points of the year the Earth is the same distance from the Sun. At the shortest distance from the Sun we have the longest day and for the longest distance we have the shortest day, which applies in the North Hemisphere. As the earth rotates on an axis that is 23.5 degrees to the vertical, the asymmetrical elliptical orbit ensures that the reverse is true for the Southern Hemisphere. Since they are driven by the same celestial rhythms, it is the same gearing that drives the running equation of time hand and the differential times for sunrise, sunset, and the length of the day. Finally in the upper left of the dial at 11 o’clock, the Celestia has a mareoscope, a indicator for low and high tides. 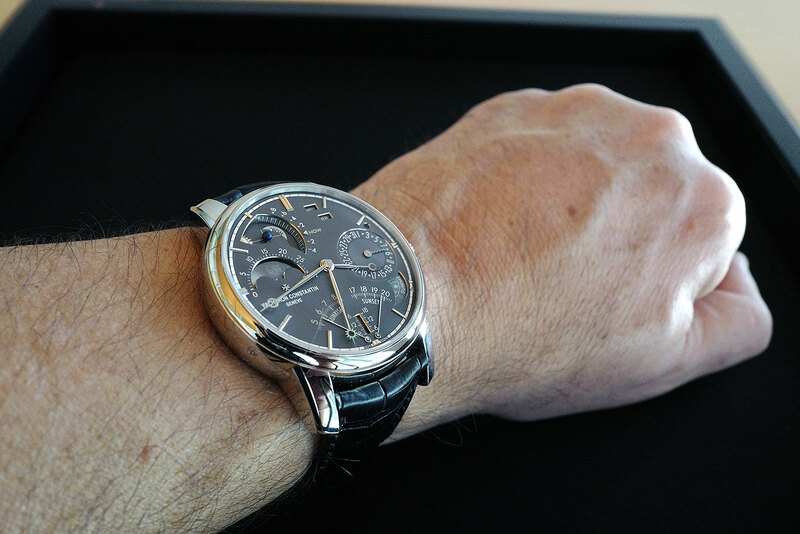 This is a rare complication, and to my knowledge has only been seen on a few watches. A 1970’s Eberhard comes to mind (or more precisely a Google search) as well as the aforementioned 18th century watch by asylum resident Margetts. Like the other complications in the Celestia, the mareoscope is interconnected and intuitive. 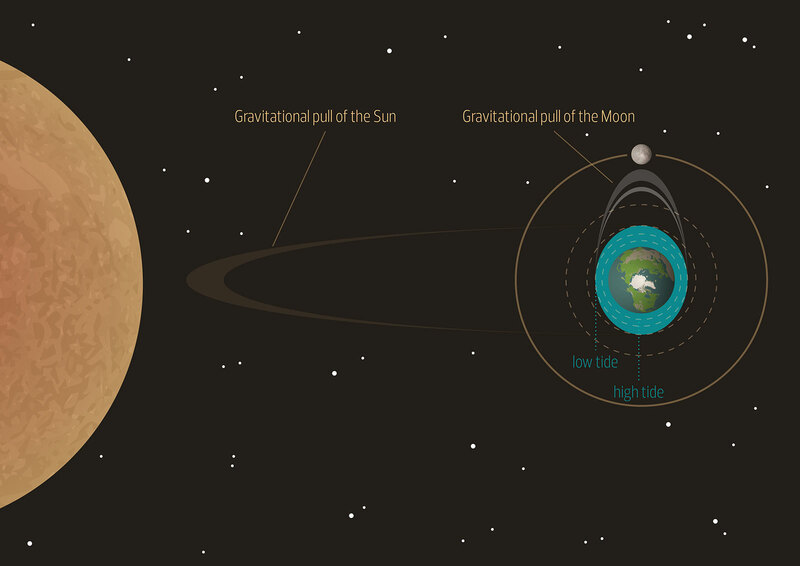 If you know the equation of time, which is based on the Earth’s distance from Sun, and the location of the Moon in the night sky via the moonphase display, then you know the gravitational pull of both celestial bodies on the Earth and the effect on the tides. Both the Earth and Moon are represented as three dimensional spheres on the marescope display, moving in real time. The Celestia’s moonphase shows the age and phase of the Moon that runs off a gear train that is a true synodic month, the time from one new Moon to the next that is about 29.531 days long and denoted on semi-circular scale above the moon phase indicator. Both the mareoscope and the moonphase are driven by the same gear train and the Celestia’s synodic gear train is accurate to a day’s error every century and a half or thereabouts. The additive effect of the solar and lunar gravitational pulls during certain points of the year cause tides to rise or fall. High tides occur when the Earth, Moon, and Sun are aligned and closest to the Earth, an occurrence known as a conjunction, and are referred to as spring tides (but have nothing to do with the Spring season). Low tides occur when when the Moon and Sun are furthest apart, known as an opposition. Because the mareoscope shows the relative positions of the Earth, Moon, and Sun over the course of a synodic month, it’s possible to approximate when tides of differing heights occur over a period of time. The mareoscope has a scale of twelve days – eight in the future and four before – around the current day to indicate past and future tides. The perpendicular cross hairs on the mareoscope dial also allow the predicting of a neap tide, which is where there is least difference between high and low tide. A neap tide occurs when the Moon, Earth, and Sun form a 90 degree angle, or a quadrature. For Christian Selmoni, the mareoscope was the part of the watch that he is most proud. In particular, he pushed the development team to design and implement the mareoscope as a 3D display that adds depth to the dial. 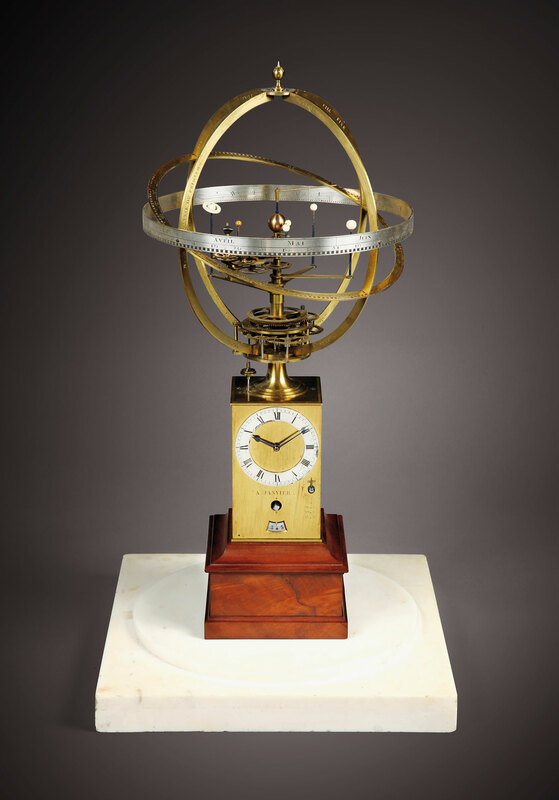 Just as importantly, the mareoscope display was influenced by the type of clocks that Janvier Antide had made. Night sky views have almost become standard on any grand complication with astronomic functions since the Graves and Packard “supercomplications” were made by Patek Philippe in the 1920’s and the Celestia is no exception. The back of the watch presents the night sky with all its stars according to the perspective of someone standing in Geneva, though that can be recalibrated for another location, with the red outlined ellipse, or someone standing on the equator with the white outlined ellipse. Fitting the night sky with two points of view is difficult and the night sky for the Celestia is an accurate and stunning representation. If you are into the celestial navigation thing, then sidereal time is a necessity. According to American measurents laboratory, the National Institute of Standards and Technology (NIST), sidereal time is the time scale that is based on the Earth’s rotation relative to fixed stars. It allows you to measure the true distance travelled by observing the same celestial object from one day to the next. In other words, sidereal time is used to locate celestial objects at the same time of day. So if you are using the lunar distances method for navigation, being able to sight the same celestial object relative to the Moon and the observer’s position on Earth each night would enable a more precise determination of where you are on the planet. What makes the watch and its cal. 3600 so impressive is that the Les Cabinotiers team figured out how to accomplish this in just 514 parts. The watch has two major patents filed on it: one for the running equation of time gear train that drives the complications based on the apparent solar time, and the second for the celestial star chart and the sidereal time display on the back of the watch. More generally, the division of the movement into three gear trains allows modification according to the bespoke needs of a client, and while this watch is unique, alterations can be made to the complications and layout while still retaining much of the work that has already been invested in the five years necessary to develop the Celestia. It is a very accomplished watch in both design, manufacture, and function. 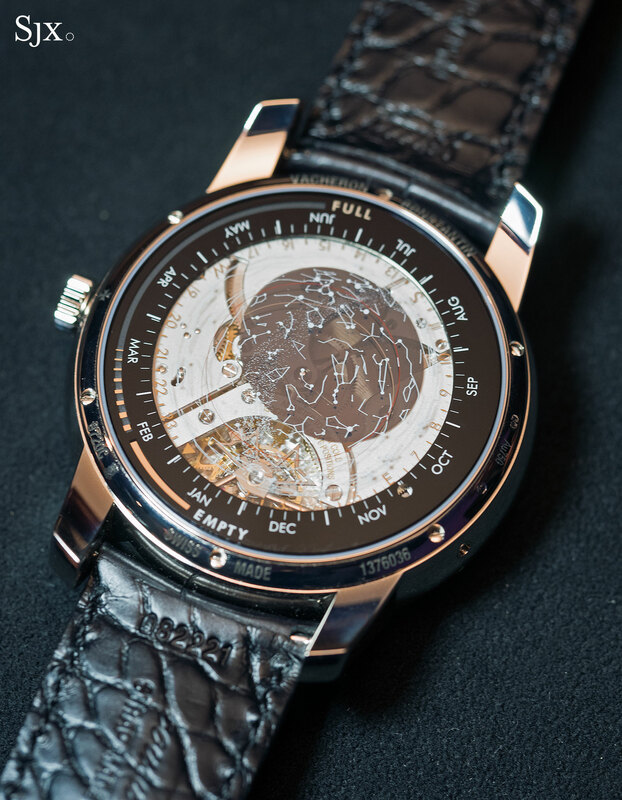 The Celestia Astronomical Grand Complication 3600 (ref. 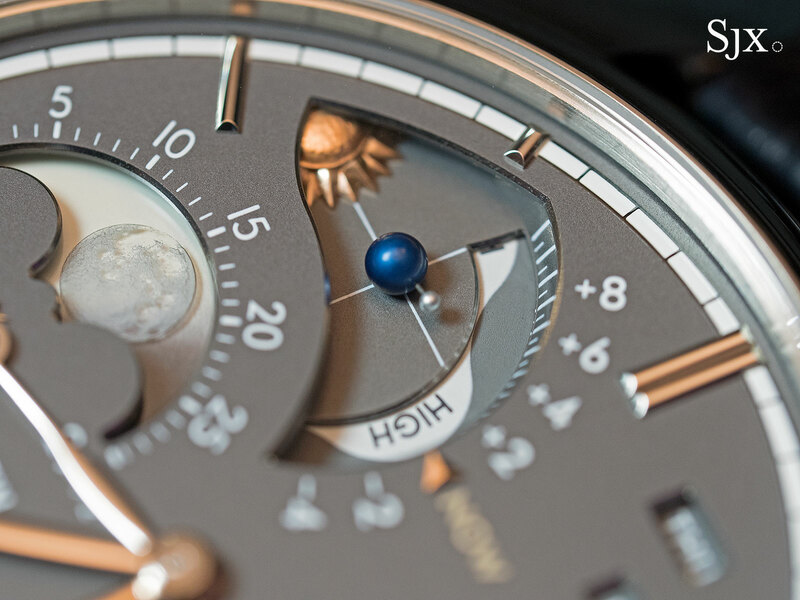 9720C/000G-B281) is made to order, with all the astronomical displays customisable for the owner’s location. It is priced at about €900,000, or about US$1m. Twenty three complications that cover every conceivable aspect of the cosmos inside a one of a kind wristwatch.